Stevens sees three crises in American judicial statesmanship. The first was the crisis of the founding. The well being of the country was subjected to grave danger, culminating in the crisis of the Civil War, and a refoundation was required. During the mid twentieth century, the United States faced the possibility of destruction, World War II and, the finding of malfeasance of the nation in the office of the president. The constant excitement of contest with antagonists makes it difficult to say whether the current crisis of the Supreme Court is merely a continuation or a whole new problem.The political leaders who resolved the first crisis and founded the Republic bequeathed as a part of that foundation the United States Supreme Court. During the subsequent history of the country, and with respect to its crises, the Court played a large part. Whether or not it does so well in the current period depends upon the quality of its judicial statesmanship. The judge is a person who acts. But it is considered action and considered action is based on prior understanding. 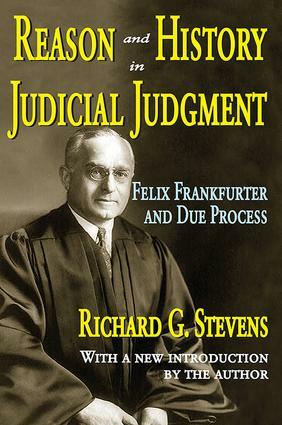 The character of the Court's understanding, or direction, reveales itself in the course of its division over the application of the "due process" clause to state criminal proceedings.Frankfurter's view is problematic. If Western civilization is to be preserved, it must be because it is worth preserving. If it is worth preserving it must be because it is good. If so, can it be preserved by reliance upon and reference to itself, or must reliance not be placed upon that by virtue of which the thing to be preserved is worthy of preservation? This problem is not new to Western civilization. Much has been written about Frankfurter, and common descriptions of the terms "restraint" and "pragmatism" to characterize his doctrines. Previous treatments of these doctrines now available have not seemed adequate. The intention of "Reason and History in Judicial Judgment" is to treat them as ethical problems rather than as self-explaining conclusions.